Artist's concept of an asteroid striking Earth. The world is still vulnerable to a potentially catastrophic asteroid strike, according to President Barack Obama's chief science adviser. NASA has made substantial progress in finding the asteroids that pose the biggest threat to Earth, but there's still a lot of work to do, said John Holdren, director of the White House's Office of Science and Technology Policy. 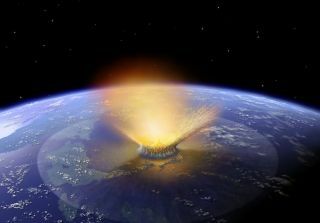 Holdren cited the February 2013 meteor explosion over the Russian city of Chelyabinsk and the 1908 Tunguska airburst as reasons to take the asteroid threat seriously. The Chelyabinsk strike, which injured about 1,200 people, was caused by an object that is thought to be about 65 feet (20 meters) wide. The Tunguska event was much more powerful; a space rock perhaps 130 feet wide (40 m) exploded over a mostly unpopulated region of Siberia, flattening 800 square miles (2,070 square kilometers) of forest. Both strikes caught the world completely by surprise. "We know that this does happen," Holdren said. Strikes such as the Chelyabinsk impact are thought to happen once every hundred years, he added, while Tunguska is regarded as a once-in-1,000-years event. But, Holdren said, "if we are going to be as capable a civilization as our technology allows, we need to be prepared for even those rare events, because they could do a lot of damage to the Earth." "This is a hazard that, 65 million years ago, the dinosaurs succumbed to," he added. "We have to be smarter than the dinosaurs." ARM can help educate us, Holdren said. In late 2021, NASA aims to launch a robotic probe toward a near-Earth asteroid; the current target is a 1,300-foot-wide (400 m) rock called 2008 EV5, but that’s not set in stone, agency officials said. The probe will then head back toward Earth, eventually placing the boulder in orbit around the moon. Astronauts aboard NASA's Orion space capsule will visit the purloined rock in the mid-2020s, agency officials have said. The $1.25 billion ARM mission should help researchers learn more about asteroids and the resources they possess; demonstrate many of the technologies needed to get astronauts to Mars (which NASA aims to do before the end of the 2030s); help the agency practice human operations in deep space; and hone some of the skills that will be needed to deflect a potentially dangerous asteroid one day, Holdren said. "The asteroid-retrieval mission makes sense in about five different ways," he said. While smaller asteroids can do great damage on a local scale, experts think that space rocks must be at least 0.6 miles (1 km) wide or so to threaten human civilization. NASA scientists estimate that they have found at least 90 percent of these mountain-size, near-Earth asteroids, and none of them pose a threat for the foreseeable future. Gravity tractors aren't the only possible defense against incoming asteroids. For example, dangerous space rocks could also be knocked off course by "kinetic impactors" (a series of spacecraft that slam into them). Some researchers have also proposed destroying asteroids with nuclear bombs; this is usually regarded as a last-resort strategy, to be used with space rocks that are discovered too late to deflect via gravity tractors and/or kinetic impactors.